DIY plant pots are a must when it comes to up-styling your patio or home decor on a budget. You can easily spend a small fortune on fancy ceramics and cute clay pots, especially if you have a lot of plants to take care of! After browsing the interwebs for cool alternatives to expensive and fancy pots, we came across 10 DIY plant pots designs that look great and are easy to make. These homemade flower pot ideas will help you up-style your decor while staying within a reasonable budget. Hold off on recycling your old plastic containers and use them to make DIY flower pots. For these painted pots, I used cat litter containers, of which I have plenty thanks to my two kitty cats. Don’t forget to drill some holes at the bottom of the containers before you start painting. Make sure you are working in a well-ventilated area and wear gloves for extra protection. You can use outdoor paint and mix and match the colors to get interesting hues. The final trick to this simple pot painting idea is highlighting all the different shapes and shades with back paint. This will make the hues stand out, giving the pot a more professional look. You can find step-by-step instructions in our blog post on making DIY flower pots out of plastic containers. Looking for a more natural, rustic look? Grab some twine or rope and use it to make a cute decoration for your DIY plant pots. The pots themselves can be made from re-purposed plastic containers, or you can use the cheap plain pots you get from the store when buying a plant. You can wrap different colors of twine around the pot to hide its original color. If the shape of the pot is wider at the top, narrow at the bottom, glue the twine on the pot instead of wrapping it. Another DIY decoration you can make with twine is tying wooden sticks around the pot. This will give it a more rustic look. Use three strips of twine and tie them around each of the wooden sticks (top, middle, and bottom of the stick). Then, tighten the twine strips around the pot. You can also add some corks to complete this rustic flower pot makeover. 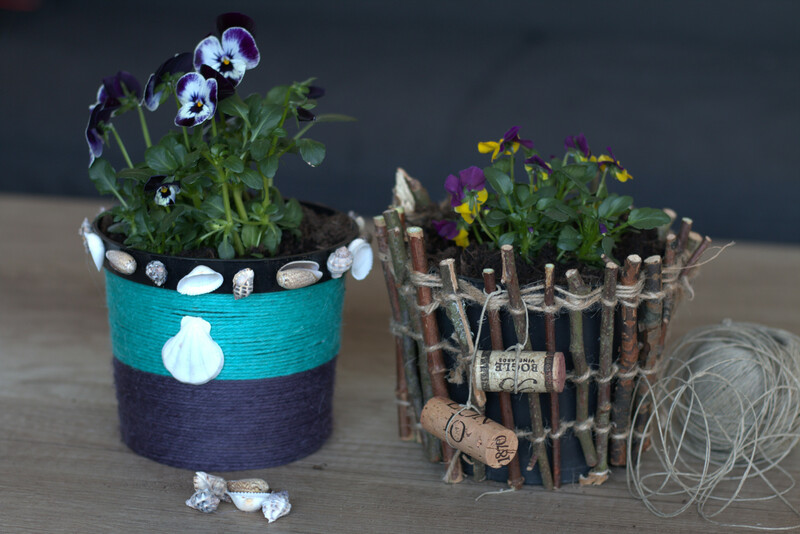 For a step by step how-to, check our blog post on making DIY flower pots with rustic and nautical decoration. To add a bit of spark to your patio, make this DIY painted terracotta pot. We found this DIY gem on Dinah’s DIY blog – diyinspired.com, and immediately fell in love with it! It is very easy to make and, most importantly, it looks great and upstyles your patio! All you need is a plain terracotta pot, gold spray paint, and white chalk paint. Start by setting the pot upside down and spraying the top with the gold spray paint. Then, paint the rest of the pot using a painting brush and white chalk paint. Once the paint is dry, apply another coat of the gold spray paint on the lip of the pot. For this DIY plant pots idea, you don’t need to look any further than your pantry. Turn some of your old tin cans into cute flower pots by painting them and drilling a few holes for draining. We got this idea from Angie’s Little Inspiration DIY blog. She used acrylic paint to turn tin cans into DIY spring can vases. To make flower pots instead of vases, use a nail and a hammer to make a few holes at the bottom of the tin can. You can use acrylic paint if the pots will be indoors. However, if you want to use them in your patio, get outdoor paint instead. Make sure that each layer of paint is dry before applying the next layer. We immediately fell in love with Jenni’s dye flower pot idea because it combines two of our favorite things – pastel colors and easy DIY rojects! To make these cute pots you only need a couple of white pots, tie dye, and a half way filled bowl of water. Once you pour the dye in the water, dip the pot halfway for 5 seconds. Then, dip the pot again, to a line lower than the original one, and keep it in the water for 10 seconds. Finally, leave only the bottom of the pot in the water for a longer time until you get a more intense color. Check out Jenni’s Dip Dye Succulent Pot blog post for a step by step how-to. These gold leaf planters have that dreamy vintage look we are always searching for. Instead of digging through a flea market though, you can make these cool pots using old tin cans (yes, today will be a good day for cooking and using some of the tin cans you’ve been storing away). To make these planters you will need a few tin cans, spray paint, gold leaf, gold leaf glue, and a paint brush. Start by painting the pots in the desired color with the spray paint. Once the paint is dry, use a brush to apply the gold leaf glue in random patches on the cans. Glue pieces of the gold leaf and use the brush to lay the leaf flat on the can. For more detailed instructions and really cool pictures of the final result, check out our source of inspiration, this gold leaf planters blog post. Another great idea for all the sparkle seekers out there – DIY marbled flower pots! These DIY plant pots are made using a terracotta pot, white acrylic paint, several matching nail polish colors, and a large disposable container filled with warm water. Start by painting the terracotta pot with white paint – you may need to apply a few layers to get the color bright and clean. Then, slowly pour the nail polish in the warm water container. Do not use nail polish that is old and chunky and make sure to pour the nail polish slowly, so it stays on the surface of the water. Swirl the nail polish using a toothpick. Hold the top tip of the pot, dip it in the water, and swirl it around. Then, set it on paper towels and let it dry. Check out Artsy Fartsy Mama’s marbled flower pots blog post for a more detailed how-to. These pots are so pretty and will help you find a frugal way to re-purpose some of the nail polish you don’t use! If you are looking for something simple but spectacular, try this sharpie dot DIY flower pot project shared on Jessica’s Cutesy Crafts blog. All you need for this homemade flower pots idea is a sharpie and letter stickers. If you have a white flower pot with smooth surface, you can go ahead and use it. If not, you can paint any smooth pot or container with white paint, let it dry, and then apply the sharpie decoration. Once you have your pot ready, place the letters on the pot and use the sharpie to make dots outlining each letter. You can spell your name, or, as Jessica suggests, write the names of different herbs for a cute herb garden. To give your patio a unique and cozy vibe, try making these DIY plant pots out of rubber boots. I’ve been spotting cool designs for rubber boot pots on Pinterest for quite some time, but now I finally found a blog post that has a very easy to follow, no nonsense how-to. So if you like this look, check out Glimmer Twin Fan’s guide for making flower pots out of old rubber boots. You will need a pair of old rubber boots, spray paint primer, outdoor spray paint, patio paint, and brushes. Be sure to work in a well-ventilated area. Start by cleaning the boot and making a few holes at the bottom with a screw driver. Then, paint the boot with the primer. Let it dry and apply the outdoor spray paint. Finally, decorate the boot with the patio paint. Very simple and creative way to brighten up your garden! Another great idea for re-purposing old stuff – make a cute flower planter out of a laundry basket. This creative DIY is shared by Erin via elizabethjoandesigns.com. Check out her blog post on making a laundry basket planter for a step-by-step how to. You will need some burlap and hot glue to cover the basket with burlap. Make sure to also glue the burlap over the slats of the basket so that the dirt stays in. Glue the edges of the burlap to the inside of the basket to keep the outside neat and pretty. Wrap thick rope around the basket for decoration. Tie it in a loose knot and use glue to secure the knot and the rope on the basket. You should also apply some glue on the ends of the rope to prevent it from unraveling. We absolutely love the natural look of this planter!